This exhibition hall immediately establishes the interior design language that resonates throughout the building. It is an extremely flexible hall that features movable wall and floor-mounted panels, a suspended steel grid on a high ceiling for equipment, decor, drapes, and art pieces. It is contiguous to the reception lobby and also serves as a spillover area for theater audiences and guests. To further add to the openness and safety of the building, large sliding glass doors connect to a side driveway, which can be used alfresco. 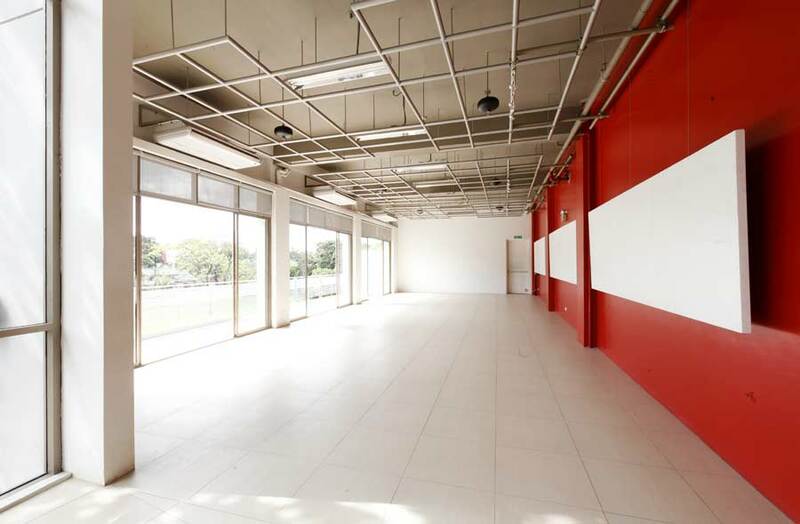 This exhibition hall is a place to explore and exercise one’s imagination and can be used for social gatherings, rehearsals, performances, workshops, seminars, conferences, and many other functions. Area: 97.5 sq. meters. Naturally ventilated. Air conditioning available.